The Standard Security Blyth and Wansbeck Sunday League held its annual presentation night at New Delaval and Newsham Social Club. The previous evening the league held the AGM, when all committee members were re-elected. President George Allen was in attendence, and although the league lost two clubs, all new clubs were elected. Chairman Colin Douglas welcomed guests, including Suzette Scott and her mother from the league’s sponsors, and fair play backers Whitley Bay Trophies’ Steve Smith and his dad Dave Smith. Mr Allen also thanked New Delaval and Newsham Social Club and its staff for the continued support as the league headquarters. 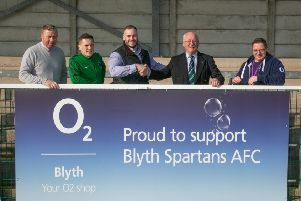 The division one secretary of the year award went to Shihab Miah from High Street Blyth, while the premier division honour was shared between Tony Mathews from Ashington RAOB and Martyn Hepple from Blyth Town Sunday. Leading goal scorer in division one was Anthony Goldie from Hight Street Blyth with 27 goals. The premier division winner was Josh Hay from Amble Tavern with 22, although he scored nearly 50 goals in all competitions. Player of the year, which goes to the player with most man of match awards selected by other teams in league games only, saw Les Thompson from North Shields Pineapple win the division one award with ten nominations, and Ben Harmison from Ashington RAOB with six taking the premier division honour. The Bill Young Fair Play Award, sponsored by Whitley Bay Trophies, went to Guide Post Shakespeare Tavern. They also get a cheque for £325. The Dennis Fowler Referee of the Year winner was Paul Turner, while young referee, renamed in honour of Jimmy Scott who sadly passed away earlier this year, the boss of league sponsor Standard Security, went to Mathew Bartlett. The Harry Kennedy award for Achievement went to Guide Post Shakespeare Tavern, and the President’s Cup, selected by George Allen, went to Colin Douglas. Presentations saw Suzette Scott doing the honours. Eric Anderson Cup: Ashington Station Lounge; runners-up: Cramlington Green. Alan Davison Cup, sponsored by Life Member Alan Davison: Amble Tavern; runners-up: Bedlington Social Club. Saints Shield, sponsored by C R Scott Ltd: Morpeth Conservative Club; runners-up: Whitehouse Ashington. SA Randolph Cup, sponsored by Standard Security Ltd: Amble Tavern; runners-up: Bedlington Market Tavern. JD Marnock Cup, sponsored by Reay Security Ltd: Bedlington Social Club; runners-up: Bedlington Market Tavern. George Davison Cup, sponsored by Port Traing Services: Amble Tavern; runners-up: Ashington RAOB. Division one: Whitehouse Ashington; runners-up: Marden Residents. Premier Division: Ashington RAOB; runners-up: Amble Tavern. NFA Sunday Cup: Amble Tavern.